Well, this is awkward. Been back for almost a month, and still haven't finished the travel blog. Oops. Okay. Let's do this. Paris is built on a series of tunnels. Actually, since they were originally quarries, I guess you could say that it's technically also built from those tunnels. In about the s, the cemeteries around the city started leaking dead people into basements, and so they emptied them into the tunnels. 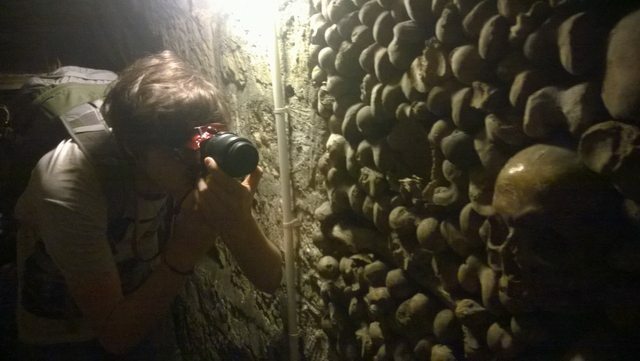 They call these the catacombs, and you can visit them. So we did. We had to get up ridiculously early and catch the Metro with all the commuters and get there an hour before it opened so that we were reasonably near the front of a queue that would eventually stretch around the block and back past the entrance again, but we did. I'm not actually sure I'd seen a real human skull before this. Especially not from a human who lived in the last few hundred years, and I'd certainly never walked down a corridor made of them before. The effect was eerie. I think a huge amount of that is intentional. 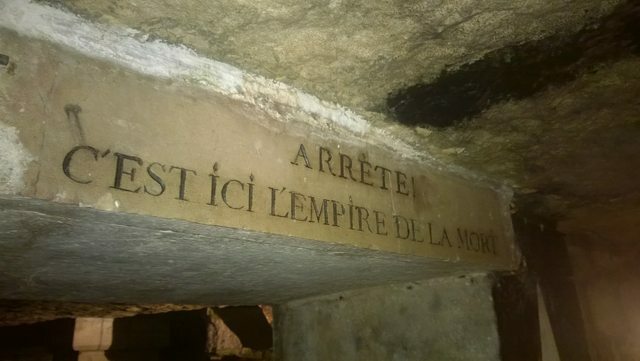 The catacombs were at one point just a big ol' tunnel full of bones, but at some point a French bloke decided to romanticise them a bit, and set about carefully tiling them and insetting them with pillars and altars and slabs inscribed with memento mori style poetry. It's the difference between an essentially hygiene-driven disposal of bodies, and a temple to the concept of death. Or, I guess, a bit like the difference between a morgue and a graveyard. Between, for want of more sophisticated words, creepy and spooky. I thoroughly enjoyed it. Pretty much the only downside was the audioguides. Nothing against these particular ones - they were very well-produced and informative. I just almost wish that I hadn't known quite so much about what I was looking at. There's a certain pleasure in stumbling on something and wondering first, then understanding, rather than having understanding injected into your earholes as you walk. 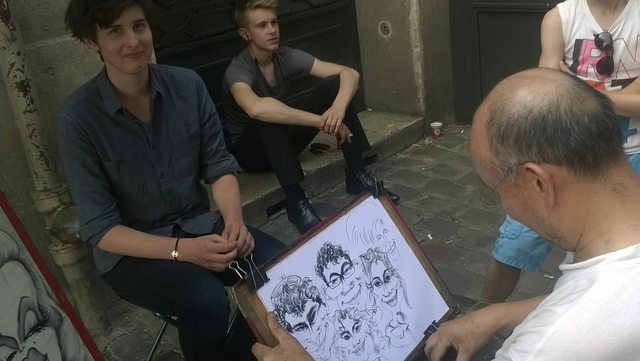 Because you gotta have a charicature done in Montmartre, right? Jess and Morgan took themselves off to a date at this point, while Grace and I took Ben to see the Eiffel tower. Somehow he had made it an entire week in Paris without seeing the tower up close, merely as a tower-y smear on the horizon. Despite what the signs in the metro say, the best station to get off at for the Eiffel Tower is Trocadero. This is because when you get off, you can't actually see it - you're behind some impressive-looking building, and there's nary a tower in sight. And then you walk around the corner, and there it is towering over you. Ben: "Holy butts! That's an Eiffel Tower!" Which just by itself I think was worth the wait. We did the thing that everyone does when you see the Eiffel tower. You wander down, sort of gawking up at it, until you're right underneath, and suddenly this world-famous monument turns into a really intricate bit of engineering surrounded by street vendors selling copies of it on a keychain. 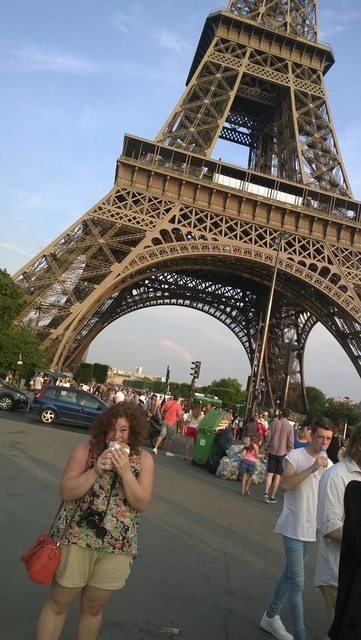 Then you wander back a bit, and find a crepe stand, and buy very overpriced nutella crepes while every so often turning around to look at the tower again, because it's something that's so famous, and so surprisingly big, and, well, holy butts, it's the Eiffel Tower, right? I had a bit of a moment walking back up the stairs. We were coming to the end of the trip, and there's something about seeing something so iconic, not for the first time, but possibly the last time (at least for a while), and I was suddenly very conscious of it. I don't usually get sentimental about views, but just this once, I stood there and for a bit and just drank it in. Friday was our last day in France, and we pretty much spent it at Versailles. I've learned on this trip that I get a bit crabby if I don't have breakfast, and I think it's fair to extrapolate that to everyone else too. Especially coupled with a very early morning and a train trip that made us woozy but wasn't quite enough to send us to sleep, and a queue that seemed to stretch forever to actually get inside. 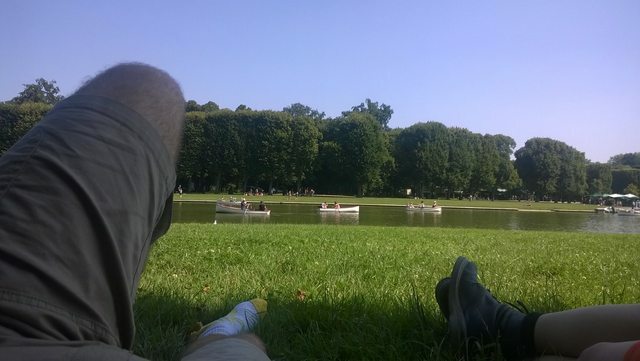 What we ended up doing was taking a walk through the gardens, grabbing a bite to eat, and spending a couple of hours relaxing and napping next to the lake. 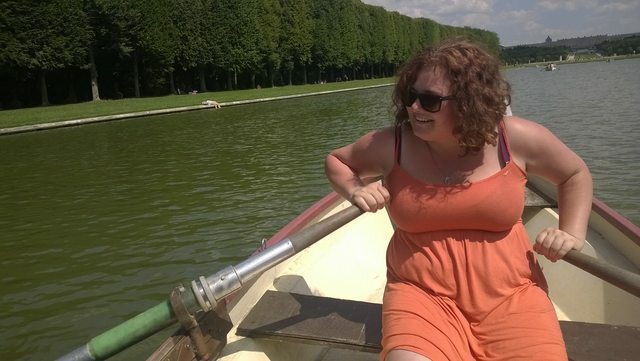 I got wonderfully, gloriously sunburnt, in a way that no weaksauce winter sunshine in Perth could possibly match, and hired a rowboat for a while. As for the palace, it was... opulent. In a way that only aristocracy can manage. I'm not actually a huge fan of having every surface covered in ornately carved ostentatiously gold-leafed squiggles and, if I'm honest, I got pretty tired of being pulled along with a current of other tourists. With the exception of the Hall of Mirrors, which was amazing, and has 'x was here' graffiti from before I was born (which I think is pretty cool), the inside of the palace was a bit of a wash for me, I think. I would rather have spent more time exploring the gardens, which were just as fascinating, but much less crowded and much less expensive. 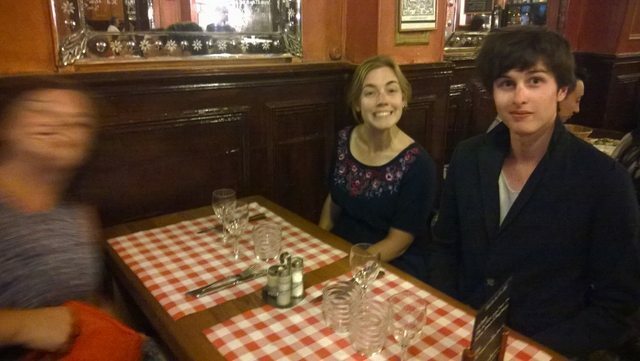 That evening, Jess took us out to dinner at possibly the Frenchest French restaurant in Paris. It was delicious - 'specially the foie gras, which I know is bad but oh my gosh - and gave us all a bit of a chance to look back on the trip. We played favourites (I believe a list exists somewhere, which I'll stick in a comment) and aired some greivances, and it was a really pleasant way to wrap up the trip. I now know that I have the basic competence to travel, on my own, for five weeks, on the other side of the world, on my own dime. Not that I didn't think I could, but having the experience to back that up is satisfying. I learned that holidaying with mates is just as much of an exercise in compromise as holidaying with your dad. And that's okay, as long as everyone knows that going in. I discovered that you can get a decent impression of a country in just a couple of days, but if that impression makes you want to stay then you'll never want to leave. I got properly, properly drunk, for the first time in my life, and while I have no particular desire to do it again, I can't think of a better place to have done it than Dublin. I also saw a musical for the first time in my life, and while I have no particular desire to do it again, I can't think of a better place to have done it than London. I really, really enjoy writing - and publishing - about where I go. It roots me in the place I am, and makes me notice details, and gets me thinking about my experience, and then forges all of that into a narrative rather than a series of disparate memories. 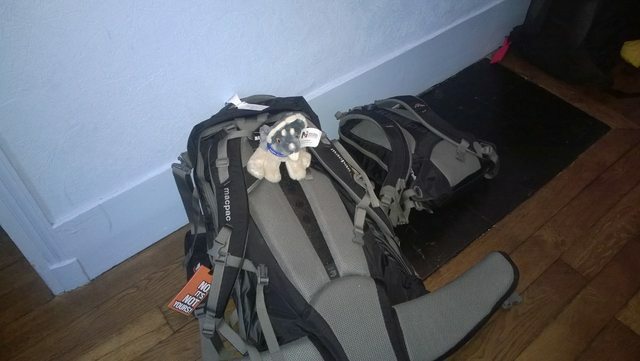 And doing all that on a smartphone, as gratifying as it is to travel light, is really bloody difficult. Next time I'm taking a laptop. I found a part of myself that really enjoys just shamelessly being a tourist, despite the rest of me's utter disdain for it, and I actually don't think it's that incompatible with also wanting an authentic experience. I learned a lot about how I think about art, and culture, and history, and where it is that the roots of the society I grew up in actually came from. I discovered that visiting places you've already been with new people can be just as interesting as visiting new places. And that places you never thought you'd enjoy, or that you thought you already knew, can be transformed by someone else's perspective. And that having other people's plans differ from your own can take you places you'd never even think to go on your own. And that sometimes, it's not where you go that matters. It's who goes there with you.